When the Rohde family purchased a ‘70s-era cottage in Door County, Wisconsin, they fell in love with the lake view, the natural Vermont slate floors and the Cape Code style. The guest bathroom, however, was a challenge—in both function and fashion. While the bathroom was intended to be a primary space for the two sons, at 6′4″ and 6′5″, neither found it to be a good fit. Each time they visited the cottage, both skipped using the whirlpool bath and instead walked through their parents’ bedroom to shower in the master bathroom. Frequent guests, including friends and extended family, did the same, and that inconvenience got the family thinking about a remodel. The Rohde began the discussion by thinking about how they used the bathroom and what could make it better. As they talked, they kept coming back to the idea of storage. Because both sons left their toiletries in the bathroom year round and guests brought their own as well, the existing space often felt cluttered. They also wanted to add a shower and, because the 6′ x 10½′ room had limited space, knew they’d need to fit it where the whirlpool currently existed. Instead of simply swapping out the bathing area, they all agreed it was a good time to do a complete remodel. With a few features in mind, the family started to look for design inspiration. Ms. Rohde, who enjoys design, dug into sites like Houzz and Pinterest, watched design shows on TV, and talked with one of her good friends who is a professional designer. She and Mr. Rohde also visited their local showroom, the nearby Kohler Design Center, to see and touch products in person. Then they tapped into a designer who could help them create a new look that would complement the home’s Cape Cod style. 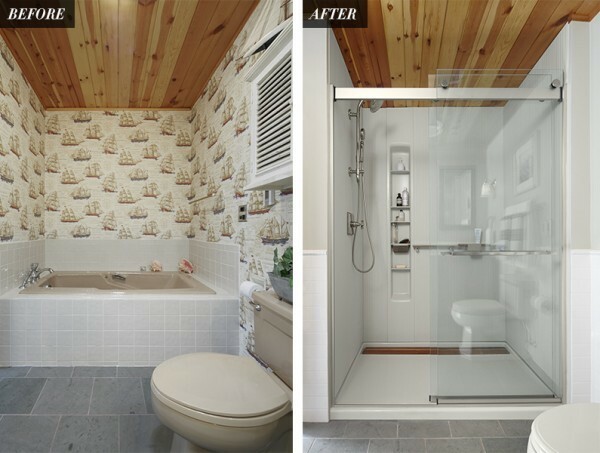 Their first goal was to get rid of the nautical-themed wallpaper, which they felt was childlike. They were also anxious to say goodbye to the outdated Cultured Marble countertop and ugly cabinet. Going from a whirlpool bath to a shower had a few implications for products. The Rohdes wanted customization and storage but needed something that could fit where the existing bath was and still stay within budget. They eventually chose Choreograph® shower walls with built-in storage. Because they were remodeling a vacation home, maintenance was also an important consideration. Without grout lines, the Choreograph shower walls made sense for the busy family. And with adjustable shelving, there was plenty of space for even large shampoo and conditioner bottles. Keeping storage in mind, they also looked for ways to tuck away personal toiletries, extra towels and other essentials. A dual-sink vanity provided that space, and its pullout drawers with built-in electrical plugs delighted guests who were quick to plug in their hairdryers. They found additional storage in the recessed medicine cabinets, which feature pullout makeup mirrors as well. With the design created and products chosen, the Rohdes decided to hire a contractor to take care of the project. After the work was complete, the family returned to a bathroom with renewed functionality and appearance. A wood-panel ceiling, subway tile and muted colors throughout created a beautiful complement to the home’s Cape Cod style. Thinking about updating the design and functionality of your bathroom? Whether you want to revitalize your outdated space or switch to a completely new look, our Bathroom Design Service can help you. It’s quick, affordable and allows you to work together with a Kohler Designer to make your dream bathroom a reality through online personalized meetings.